Twelve years ago, I took a cooking class while on a trip in Thailand. It was just after I finished studying photography, and I took a long trip to the Far East and Australia (as many young Israelis do). At that time, I wasn’t nearly the foodie that I am today, and I took the cooking class, because that’s what most of the tourists where doing in that particular town. Twelve years ago, I barely knew anything about the Thai kitchen, couldn’t eat anything even a tad bit spicy, and I basically lived on Pad-Thai the entire time I was there. Now, twelve years later, I wish I could back and eat everything I didn’t. 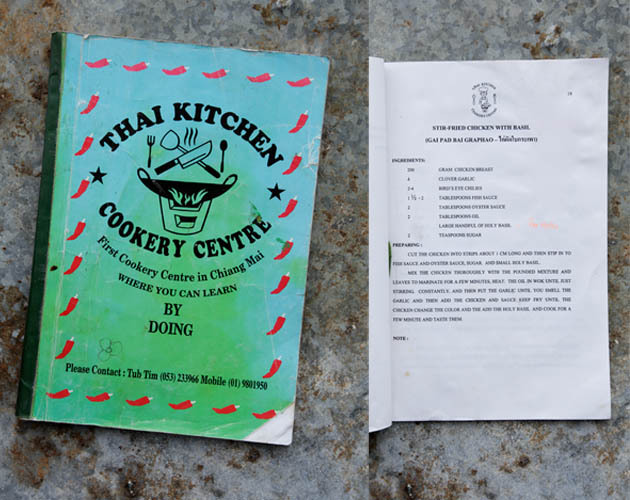 Upon completion of the cooking course, we received a little Thai cookbook (if you can call it that) with lots of English typos and not one picture. I kept as a keepsake from the trip and I used it a few times when I just got back. I haven’t touched it in probably over seven years and I just recently found it and now that I’m a Thai food junkie, I have a newfound love for that little green “cookbook”. Nowadays I can whip up a Thai meal in no time and without a written recipes, but this cookbook was definitely the base of my learning. It’s amazing that with just a few key ingredients, you can really make a whole meal in relatively little time. The most important lesson I learned about Thai cooking is that you have to really incorporate the four flavors: sour, sweet, salty and spicy. And while I’m on the topic of fish sauce I have to say that anyone who has ever tried authentic Thai cooking knows that there is no such thing as Thai food without fish sauce. 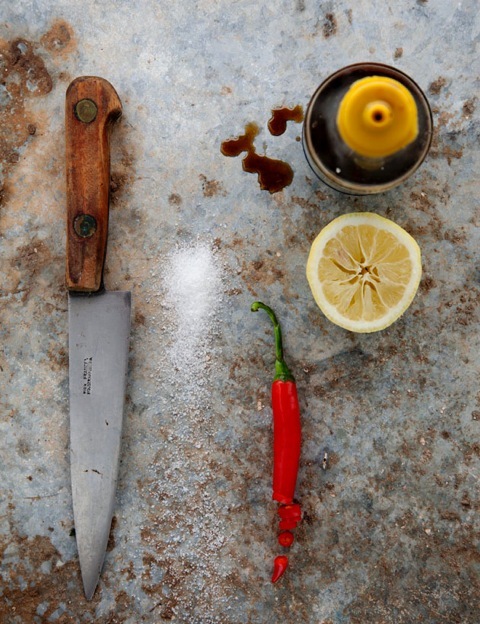 Don’t be deterred by the smell or taste of the sauce itself- because once you add it to any Thai dish- it makes all the difference (and really doesn’t taste fishy). I decided to share these two recipes, both from that little green cookbook I got 12 years ago, because a. they are delicious and b. because they literally take 15 minutes to make and you have a whole Thai meal. For all of you Thai food lovers out there- you can also check out our recipes for green papaya salad and this post that has some great East Asian recipes. 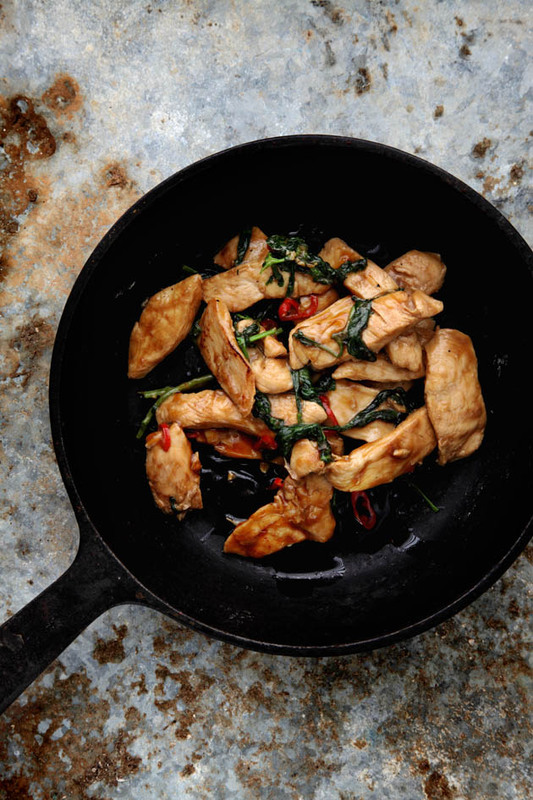 The recipe calls for Holy Basil which is a Thai variety of basil that is much more aromatic than the regular type. If you can’t get your hands on holy basil, then the regular basil will work just fine. This dish works great when served with plain white rice. In a large bowl, mix together the fish sauce, oyster sauce, sugar and lemon juice. Add the chicken strips and mix well. Allow to marinate for at least 30 minutes to 3 hours. Heat a wok on high heat and add the oil. Cook the garlic until fragrant and then add the chicken with the marinade and stir fry until the chicken is cooked through. Add the basil leaves and cook until the leaves are wilted. Remove from heat and serve hot. For a “meatier” salad you can add glass noodles soaked in boiling water for 5 minutes. 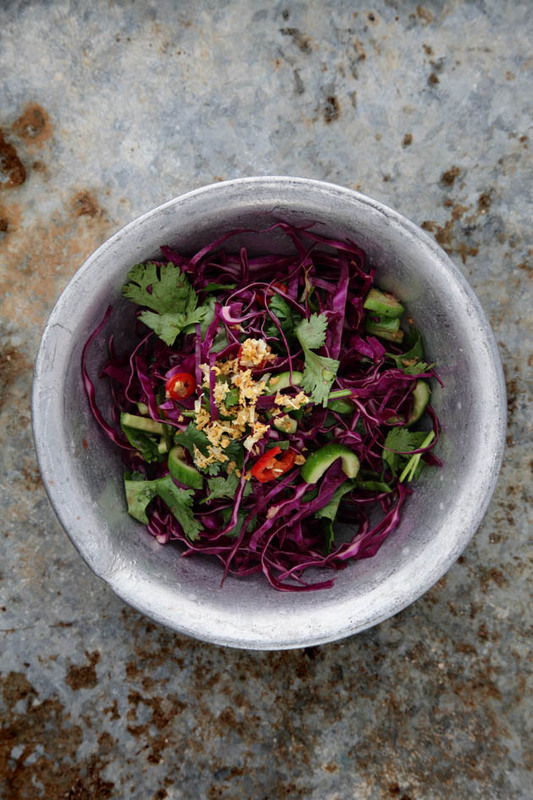 In a large bowl mix together the cabbage, cucumbers, chili and cilantro. In a separate bowl mix together all the ingredients for the sauce and then add the sauce to the cabbage mixture. Serve with cold topped with fried garlic.